Dallying In The Dirt, Issue #253--- More then a 1000 Crocus dwarf my plantings. Earlier this week I planted all of my Pepper and seeds. There were about 8 varieties of sweet peppers and a couple of hot types. Three of those Peppers were new varieties, Cornito Giallo, Escamillo and Flaming Jade that had all received All America Awards for 2016. Any new variety carrying those awards is sure to do well in my garden or yours because they have been widely tested across the country by a great group of impartial judges. I only had four varieties of Eggplant one of which was white. The other three came in one packet. Renees Seeds does a great job for home gardeners by making such packets. Most of us want to try more than one variety but can’t possibly use three packets of some vegetables. 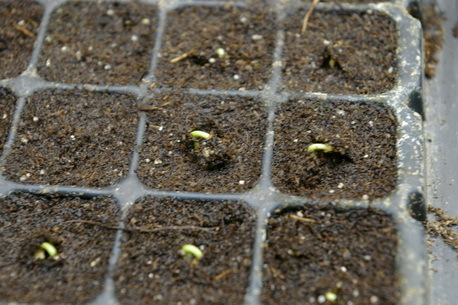 I also planted some Portulaca and Gem Marigold seeds. My seeding schedule and my “Dallying” schedule are somewhat erratic this spring due to some interesting traveling. Luckily, I have a wonderful neighbour who will watch over the germinating seedlings in exchange for some of those plants for his garden. Out in the garden some Crocus are finally popping through, giving us hope that spring is actually on its way. I like these early Crocus thomasinianus for two reasons. They are early and very importantly, the squirrels don’t like them. 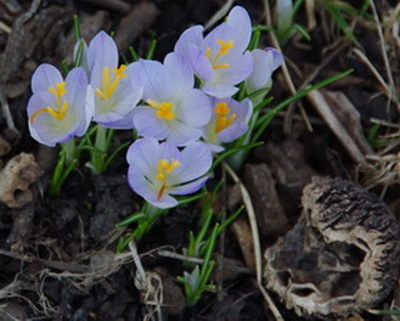 Most Crocus are a favourite food of those bushy tailed tree rats but this one species has something that repels them. They did seem to spread quite a bit for a few years but many of them seem to have disappeared over the last couple of years. Maybe the result of last winter’s very cold winter. I’m sure I planted more of them last fall and I’m waiting patiently to see where. My memory of such things seems to be less then perfect. I realize that I mention this too frequently but the Witch Hazel continues to put on a dazzling display in the back garden. A few bright red noses from the early Peonies have started to poke through the soil along with many clumps of Tulips. I sowed my seeds, watered my plants and admired my few Crocus that were in bloom. 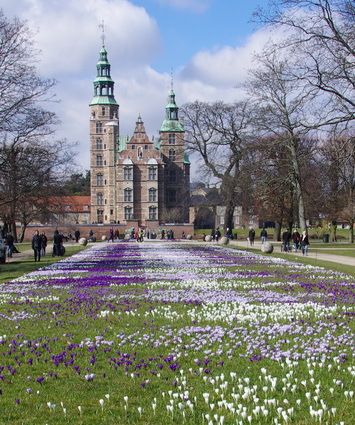 Left for the airport and woke up the next morning in Copenhagen where we found ourselves touring the Royal Gardens in the middle of the city and felt a bit inadequate about my few crocus when we saw this planting in front of one of the old palace buildings. We only had a few hours in this city between flights and, of course, we, (actually I, but the Assistant Gardener humors me,)chose to spend it touring the readily available garden. It was just a couple of weeks ahead of our gardens at home but still very interesting. It had a large knot garden with a lot of Roses whose first leaves were open on canes that were 30 - 40 cm tall and looking healthy. My Roses are lucky to have even any green canes above the ground. Some of the hardiest ones are looking better than most. I will wait to prune them when I see where the new growth comes from. Meanwhile it’s time to head back to the airport. Stay tuned for more interesting gardens. Vivian Asks? So here are my issues:...........I am getting anxious to plant my seeds but don't want to plant too early and have plants that are too tall and lanky. When would you plant tomatoes, marigolds, convolvulus, gaillardia and thunbergia, rudbeckiaAll of these say 6 to 8 weeks before the last frost. Our weather is so unpredictable these years and I usually don't like to gamble, BUT I am getting anxious to plant. Plant now...or wait to the middle of April?? After the seeds germinate either on top my fridge or the rad cover, how close to the fluorescent lights should they be? Don't want to fry them by being too close.....but also don't want them so far away from the lights that they grow too tall too soon. Ken Answers! I would start planting all of those things now. Tomatoes last, they are the fastest growing. I usually ignore the vagaries of the weather and work with the dates I have always been successful with. Frost free around the 20th of May and cold sensitive Tomatoes in the garden the first week of June. I keep my fluorescent tubes about 1" - 2" from the tops of the plants. The tubes don't generate enough heat to damage seedlings. Sharon Asks? it seems to me that in one one your news letters you talked about using the shredded paper from storing bulbs as mulch. I can not locate that now. I am wondering if you are using newspaper or magazine or maybe paper from computer . I have only ever used old coffee filters and tea bags but would be happy to use anything else especially as it seems we are to have a hot dry summer, my vegetables will appreciate it. Ken Answers! The shredded paper I have comes out of the office shredder so it has a mix of paper types in it but very little newspaper. Deidre Asks? I am sentimentally attached to this orchid. It bloomed in early 2013 and then just kind of survived. I think it grew 2 new leaves. Over the winter it has grown all these root like structures. I am wondering if it wants repotting in a bigger container? Ken Answers! Phalaenopsis orchids are very forgiving. They grow in nature on the side of trees and are used to having their roots in the air. Doesn’t need repotting. A cool period (55F nights) should initiate a new bloom cycle.